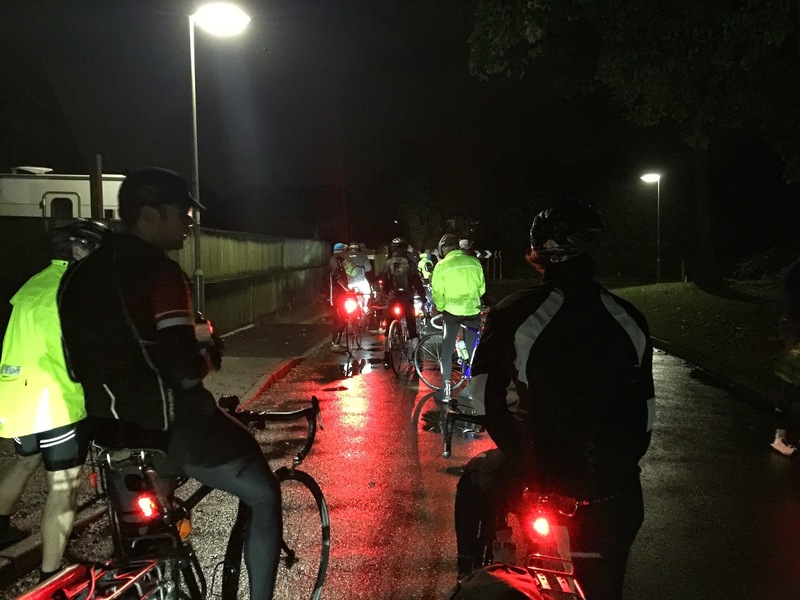 I was looking forward the night ride to Felpham. The weather forecast was not wonderful but this rarely dampens my enthusiasm for these rather addictive night rides to the coast. The meeting point was Hyde Park Corner as per usual. 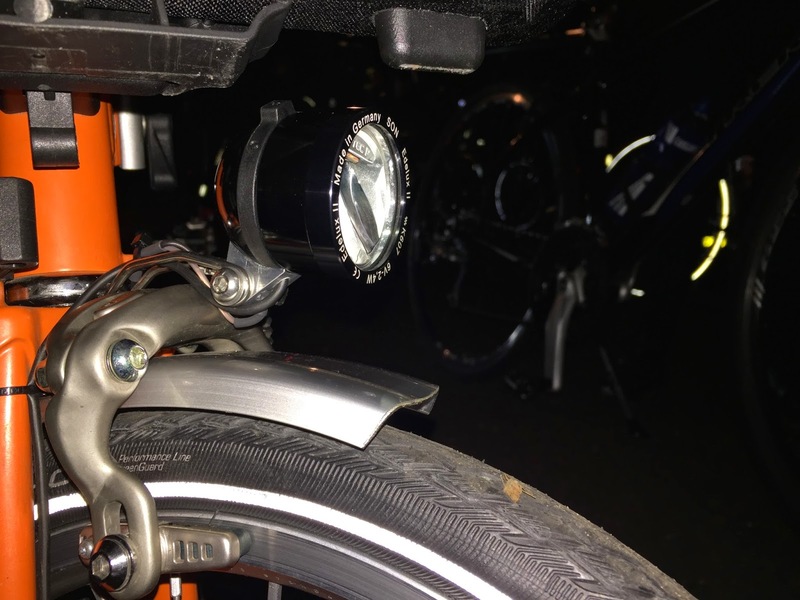 When cycling through Hyde Park I was rather keen to test out the capabilities of my new front light - SON Edulux II - powered by my SON hub dynamo. In fact earlier in the day I had rushed to the quite brilliant 'Phoenix Cycles' in Battersea to have it fitted. (I write more about this soon). My new Edulux II proved to be rather good. It was brighter, had a wider beam and a greater reach than my former light and I was suitably impressed. I had high hopes for the rest of the ride. Quite soon I was joined by David, Anne and later Geoff. 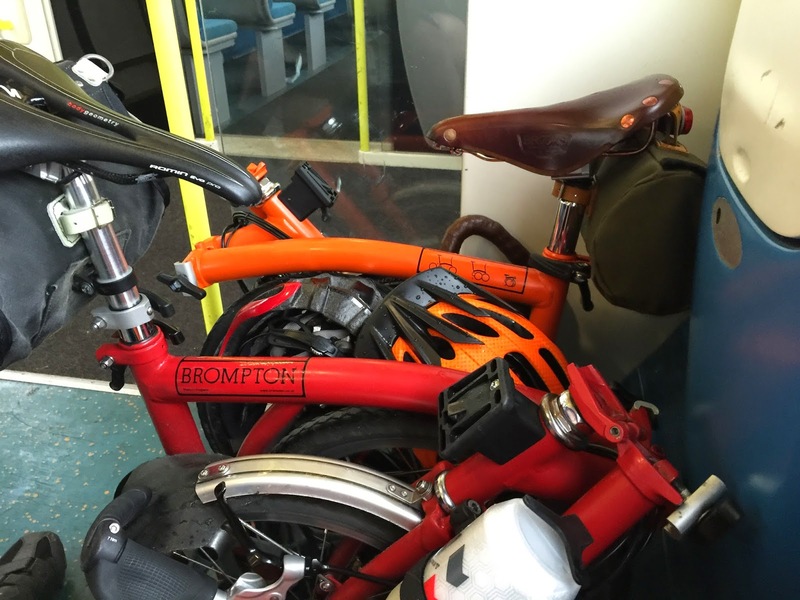 We were to be the only Bromptonians to take part in the 70 miles from Hyde Park Corner to Felpham. David was also sporting a new Edulux II and I suspect like me he was itching to see what it was like on the open road. 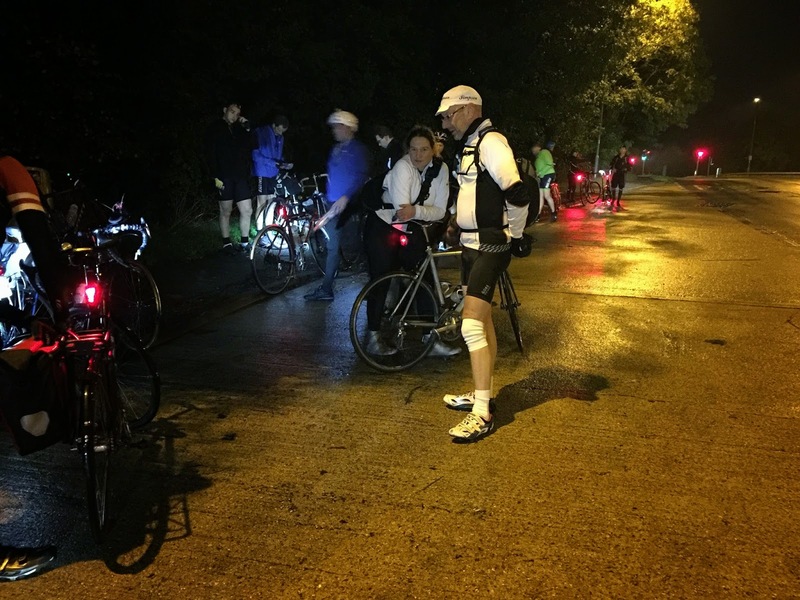 The ride started bang on midnight and soon the welcome sound of cleats clicking into pedals was resounding as we exited Hyde Park Corner. The weather was pretty good to start and the threat of rain as soon as we started didn't materialise until much later on. As you can see from the ride profile recorded by my Garmin 810 (see below) the ride was by no means flat and as such I loved it. It was demanding enough at times to keep one on ones toes in terms of gear selection. At various points the ride would stop for the tail to catch up. Sometimes I was at the front and sometimes (especially if talking too much as I cycled along) I was towards the middle. The tail end Charlie's did a splendid job of ensuring everyone kept on route safely. A huge downhill came at Reigate Hill. This lengthy section of road was approached with caution by yours truly. I had no intentions of travelling down this at 30 mph at night and with cars still very much around. 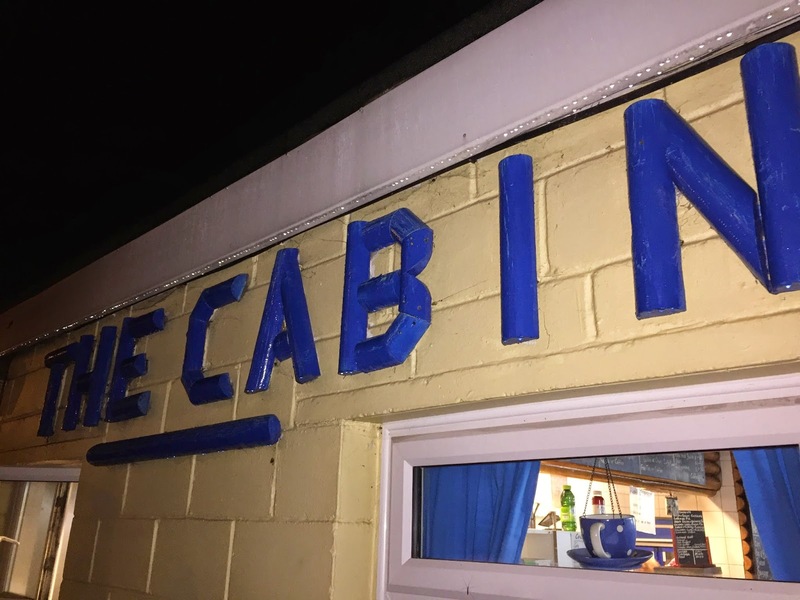 At just over 30 miles we reached Faygate and 'The Cabin.' The good people there opened up especially for us and provided a sandwich that could only be described as mid 1980's public school tuck shop. It wasn't too long until the rain fell, light at first and then gradually heavier and heavier. There was a strange stillness to the early hours of the night. 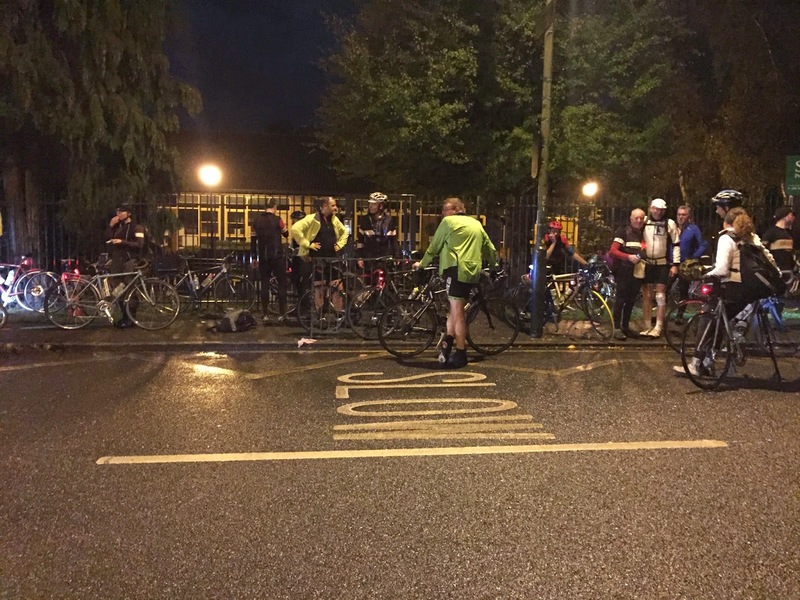 Little in the way of wind, rain and a general dampness pervaded everything. 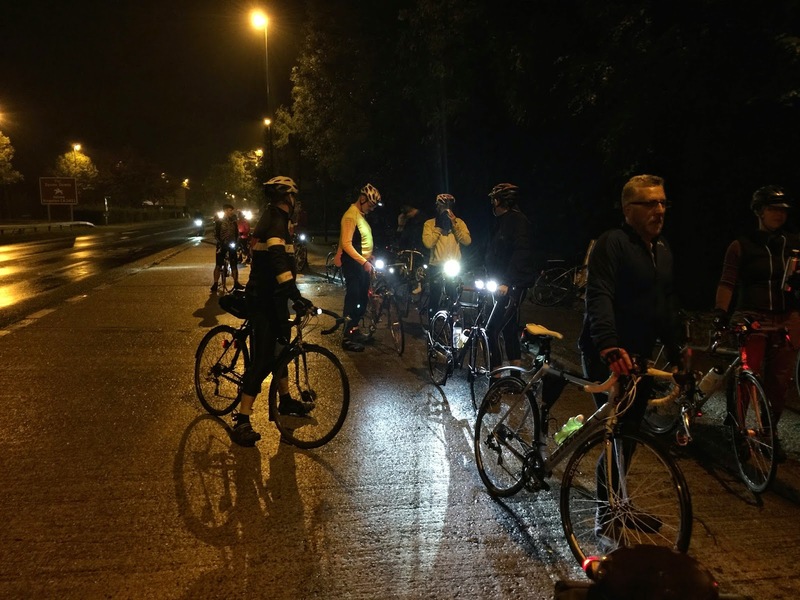 Stream started to ride from riders jackets and when we saw glimpses of countryside illuminated by the light of the moon, there were large pockets of fog swirling into mini clouds. It was quite eerie. 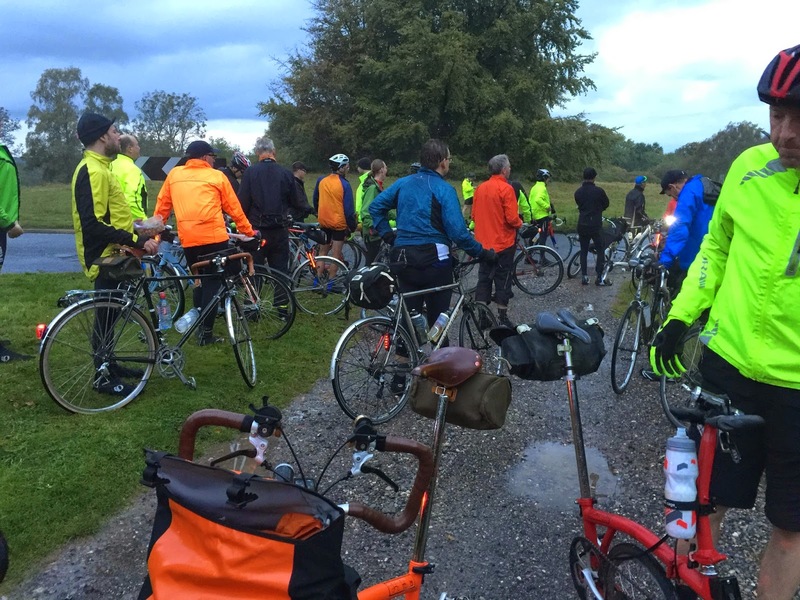 When the rain really came down many of us stopped to put on over trousers and these remained for much of the ride. As always on a ride like this, there were sections where I was cycling on my own, following a red tail light of an unknown rider in the distance. I have to say that my new SON Edulux II front light performed impeccably. The light was bright, travelled quite far down the road and also had a wide span. 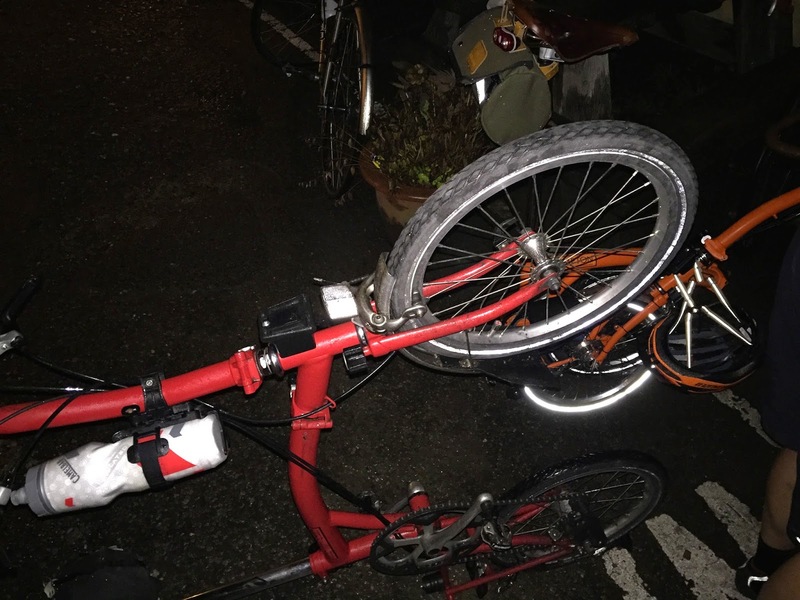 I didn't require any other lights for the entire ride and that included cycling in pitch darkness into the unknown at 18 -21 mph. It was brilliant and worth every penny. 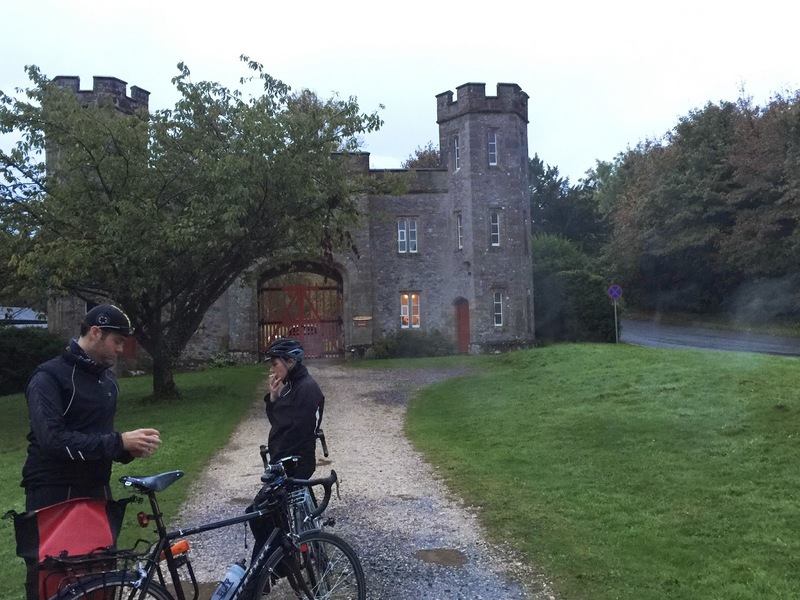 Because of the weather our route was expertly altered by our ride leader Simon. This was a joyous occasion for me as it mean we would have to ascend the infamous Burry Hill. (I have to say however, I didn't know this as I was cycling up it). We stopped just before what looked like a fairly steep road. David was off into the distance, closely followed by Geoff and Anne. As I cycled along it struck me that this was quite a hill. I also struck me that it seemed to go on and on. Before long I had bottomed out on the gears and was motoring as best I could. It was hard and my thoughts turned to Ditchling Beacon. Whatever this hill was (I didn't know its name as I cycled up) it was as bad if not worse! As I cycled along I asked on of the other riders what on earth this hill was called. A shout of 'Bury Hill' between deep breaths was heard. After what seemed like an eternity and several false summits I reached the top. As I I had done it! Bury Hill was conquered without a foot touching the ground. By the time we reached the rather pretty Arundel, the rain had stopped and it was light. We made our efforts toward the final pouch and the last few miles. My Garmin said 69 miles and we had reached Felpham. As we approached Felpham the weather looked kindly upon us and we were treated to some sunshine. Part of our route along the sea front was walking only as a recent storm had displaced much of the shingle beach onto our path. 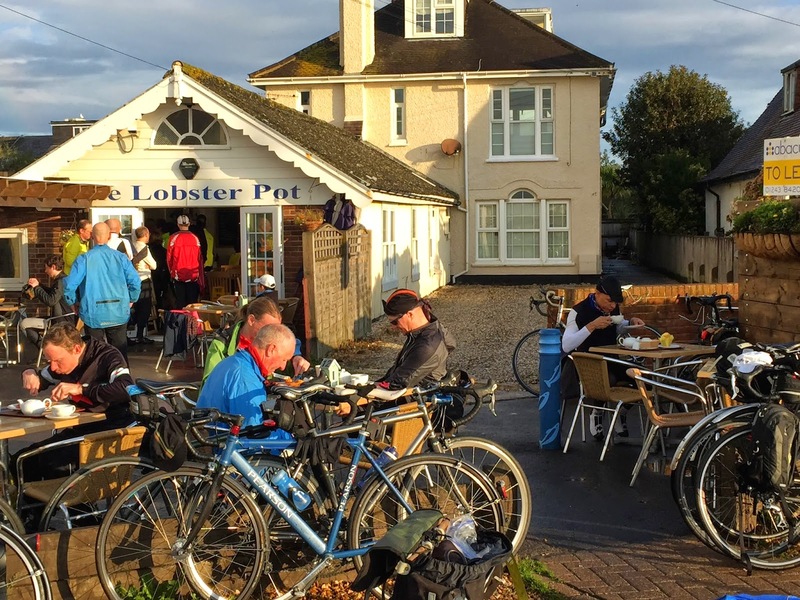 The Lobster Pot awaited and soon we were standing in line placing orders for a quite wondrous breakfast - well earned by all after our nocturnal cycling adventure. David, Anne, Geoff and I ate outside as it looked so lovely. 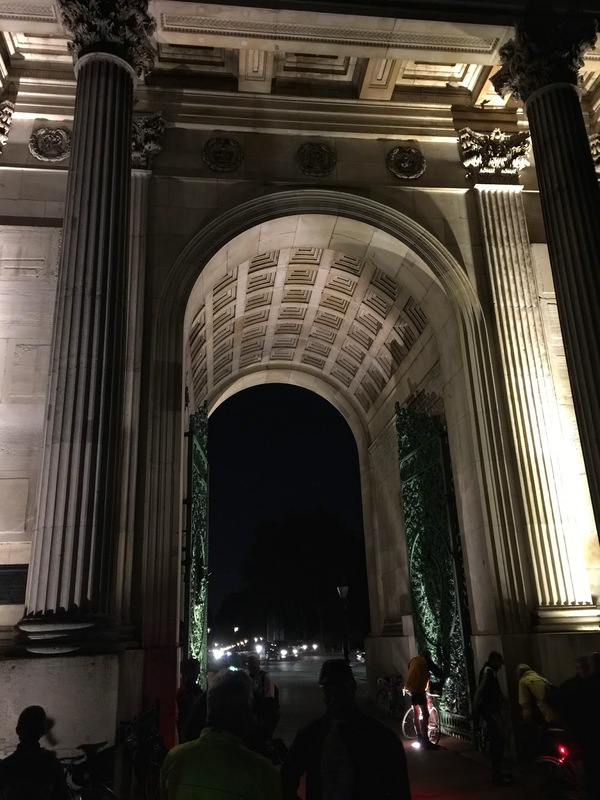 As I had pre-booked my ticket to London I could not really hang around too long. With my goodbyes made Geoff and I headed for Bognor Regis railway station only a few miles away. This tasted as good as it looks! I put the details into my new iPhone and Geoff bravely followed my navigation. With voice commands informing me I should travel, 'west' I headed in the only direction that looked feasible. Luckily we made it there and I was triumphant in my short navigation! Our train was prompt at 09:26 and Geoff and I managed to get some good seats. I got off at Clapham Junction while Geoff continued to Victoria. As we got to the station the heavens opened and the rain started to fall quite heavily. I have to say that my 'Proviz 360' was something of a revelation. It has been my favourite jacket since the kind people at Proviz sent it to me for review. (I have yet to give it back and have vowed that they will have to come and prise it out of my hands before I do so). Many riders offered high praise for this jacket. It really is quite astonishing in many ways with the entire jacket surface being reflective. Some likened me to a ghost as I gave off a slivery-white glow. The picture below sums it all up for me. Other jackets are rendered almost inadequate by comparison. This jacket just puts others in the shade! 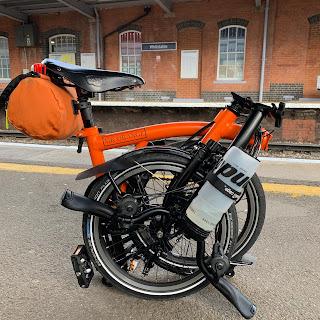 In addition to the reflective qualities the Proviz 360 performed really well as a waterproof and kept me dry in some rather persistent and occasionally heavy rain. I just feel more confident out at night wearing it and I cannot see myself using anything else now. This was another wonderful ride. 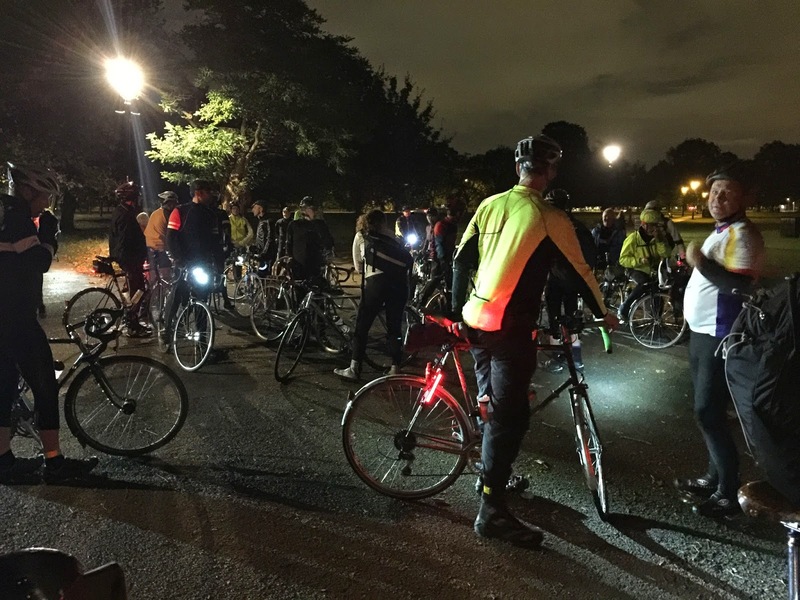 The idea of cycling from Hyde Park Corner to the coast, all overnight is nothing short of genius. I have now been on quite a few of these rides and I do love them. They are addictive and there is something very special about them. There is one more of these for this year - Southend - at the beginning of November. I greatly look forward to that. A big thank you to Simon and his tail end Charlie's and to David, Anne and Geoff for their ever welcome company.